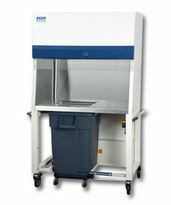 The 9400-Vacuum Waste Management System is specifically designed to handle potentially hazardous laboratory animal waste bedding. Ergonomic Enhancements – Improved productivity and reduced exposure to MSD injuries and hazardous materials. Addresses AAALAC health and safety issues. 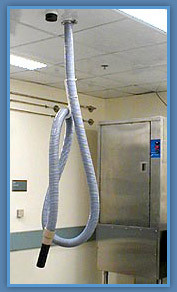 Removes Dust, Allergens & Hazardous Materials – The filtering system consists of bag filters for dust collection and a HEPA filter. High Efficiency & Capacity – High efficiency separating valve uses one-tenth the power of comparable systems. Wet, moist, or dry materials are in a continuous flow. 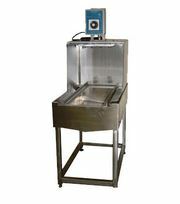 Matches or exceeds the volume presented to conveyor wash equipment. Frees valuable work-space. Clean, dust free, easy to locate. Cabinet (rear): HEPA filters the vacuum air. 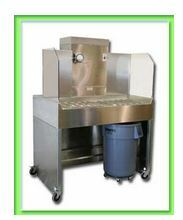 Stainless steel construction ultra quiet, high efficiency and compact. 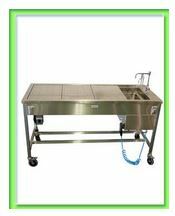 Versatile Work Station – May be located 300 feet from the discharge and discharges into any dumpster, compactor, digester or tilt cart. Can be coupled with the Automatic Dump Station, Model 6900 or other compatible equipment. Low Noise – less than 70 db @ 2′ (Cabinet). Whisper quiet at the workstation! Safe Operation – Intrinsically safe design. Does not use augers, grinders, or belts. Easy Installation and Maintenance – Compact size, convenient to locate and does not require sealed dumpsters, water, drains, or other special facility design considerations.